This lovely 70-gun, double-decker ship, built under King Charles II, was named after the Hampton Court Palace. She was a participant in many of the battles of the second and third Dutch War during the latter half of the seventeenth century.Built by John Shish, HMS Hampton Court was launched in 1678 from the Deptford Dockyard located on the banks of the Thames River, East London. HMS Hampton Court was one of the earlier warships to emerge from the Thirty Ships Program (1668-1688) of King Charles II. A two-decker designed with a fully rigged sail plan, she was approximately 150 ft. long by 40 ft. wide and carried a crew of 500 men. Sometime between 1699-1702 she underwent a major rebuild at Blackwall Yard in which much of her structure was replaced. In 1707 Hampton Court, along with Grafton, another 70-gun British warship, was captured by the French just off Beachy Head. She was eventually sold to the Spanish sometime prior to Spain’s postwar resumption of voyages to the New World after 1714. Hampton Court, under her new name of Nuestra Senora del Carmen, was assigned to sail as part of the Spanish 1715 (treasure) Fleet. 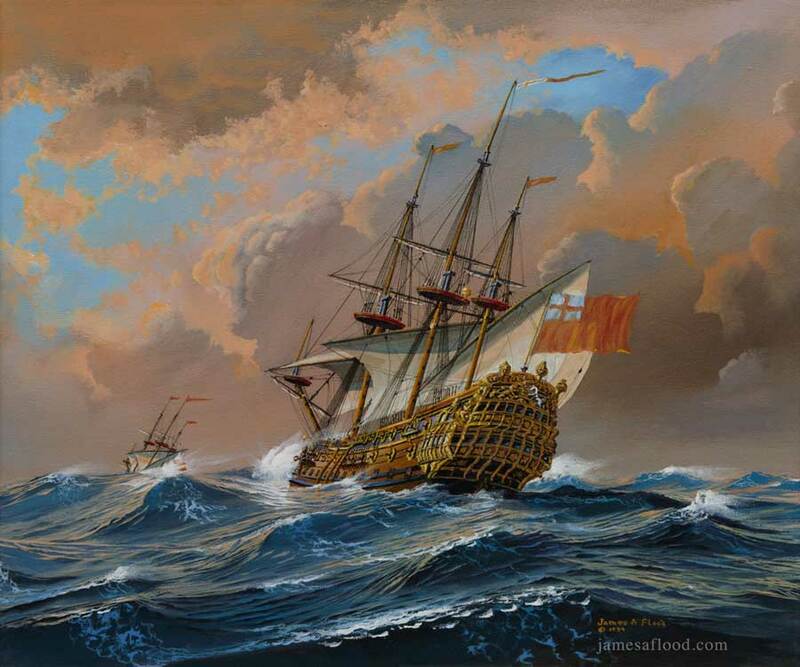 It was to her misfortune that in the summer of that year, after being joined by an additional fleet and heading home loaded with treasure, that the entire armada encountered a violent hurricane off the east coast of Florida. Ten of the ships sank in the storm including the former Hampton Court, their remains ending up scattered along the shoreline and throughout offshore waters. Hampton Court was the one ship that managed to sink intact and near shore, most of her structure above water. In this painting HMS Hampton Court is portrayed battling a sudden gale in the English Channel.